While young women today are more savvy and independent than ever, most still want a partner−someone to share a romance with, or maybe even a lifetime. But all too often, their relationships crash and burn. 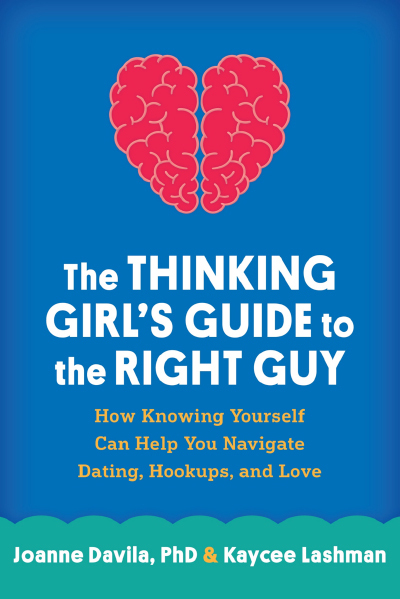 This empowering guide shows women how to shift focus, so instead of trying to be what he wants, they can figure out what they need to be happy and fulfilled−and whether he has what it takes. Vivid, realistic stories of diverse women in their 20s are interwoven with evidence-based tools designed to help readers build confidence and achieve their goals. An exciting, caring, and respectful relationship is possible−here's how to take control and make it happen. Order from Guilford Press, a favorite bookstore, or online vendor.